I was born in Edinburgh moving to London in 1969. We bought the cottage in 1992 to have a base in Scotland . We continue to enjoy several weeks each year at the cottage we love the area . There is so much to do. We spend most of the time, if I'm not gardening, playing golf and walking. The location is perfect, the views are stunning . It has immediate access to golf, swimming, walking etc. It is within easy reach of Edinburgh and the historical town Berwick-upon-Tweed. For me it is wonderful place to relax and enjoy the wonderful Scottish countryside. Great house in a great setting. We had a wonderful week in the cottage, enjoying the coastal walk to St Abbs Head and visiting places further afield such as Bamburgh, Lindisfarne and Alnwick. The weather was great throughout, which was an added bonus for the time of year. The cottage itself was very comfortable and well resourced. Great property in a great location with sea views. We had a great week in the cottage and enjoyed several mornings on the beach at Coldingham Bay. The house itself is well equipped with all you need, with a welcome basket of goodies the icing on the cake. Highly recommended for anybody looking for a countryside break. Although we had great weather I imagine it would also be very cosy in the winter. 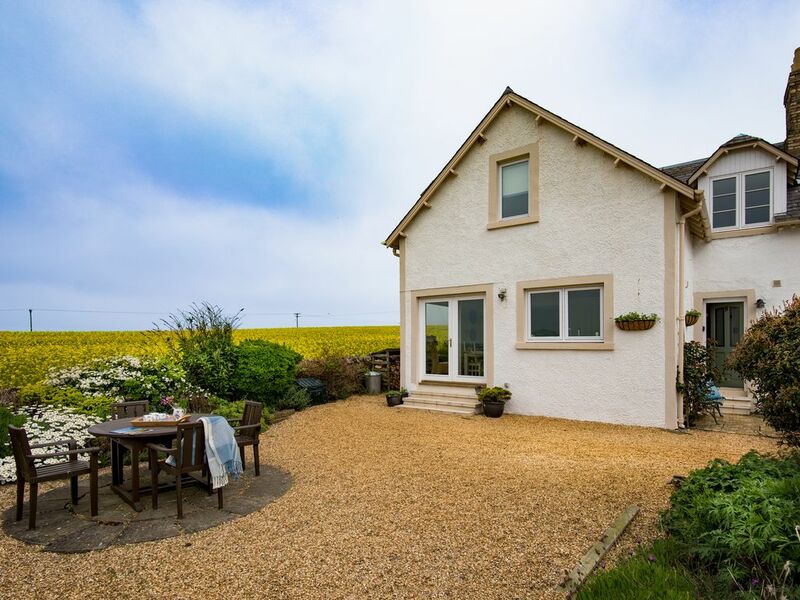 This was a lovely holiday destination, the views from the property topped everything and the local beach in Coldingham was a favourite only a 10 minute drive away. Thank you Morag I’m delighted you enjoyed your stay at our cottage. And indeed the surrounding area which has much to offer for families, walkers and golfers. The cottage is clean, plenty of facilities, well looked after and had everything we needed for our holiday. We had nothing to complain about. Well done to the owner. The highlight of our holiday was the St Abbs Head Coastal walk where we saw dolphins! A lovely cottage and a real home from home. The views from the cottage were beautiful and we could have easily spent longer here. The surrounding area had plenty to keep us occupied for the week and still left places to explore on future visits. We don’t often return to places but I would certainly consider coming back here. Probably the best holiday cottage we have stayed in. Thank you we have some lovely memories of a great family holiday. Located in beautiful countryside with immediate access to walking paths. A mile from the nearest Golf Course and 40 minutes drive from a choice of Championship Courses. 10 minutes from a lovely a sandy beach and windsurfing. The historical town, of Berwick-upon-Tweed is a distance of 8 miles and the capital Edinburgh with its wealth of culture 40 miles.